It’s easy to forget how quickly the ‘new children’ finish drawings, yet how slowly some eat their lunches. Such a contrast to the ‘end of year children’ who, just six weeks ago, took time with detailed drawings and gobbled their lunches so they could race to the playground. After lunch play, the children put hats in their bags, have drinks and move to the mat area. and laugh at David’s antics (pg. 10-11, here). One first day we read it 4 times! Reading, writing and number are key ingredients of the calendar tasks: from left to right… date, day, attendance and number of days at school. Children are actively involved: e.g. girls stand to be counted and boys stand to be counted for attendance. After the first day, the calendar routine is first thing in the morning and by week 4, the children take turns to be the ‘calendar person’ and lead the class through the calendar tasks. The calendar wall is in the mat area for all to see and participate in. On the mat, the children read their names on prepared A4 papers. Each name is in big print at the bottom of the paper. 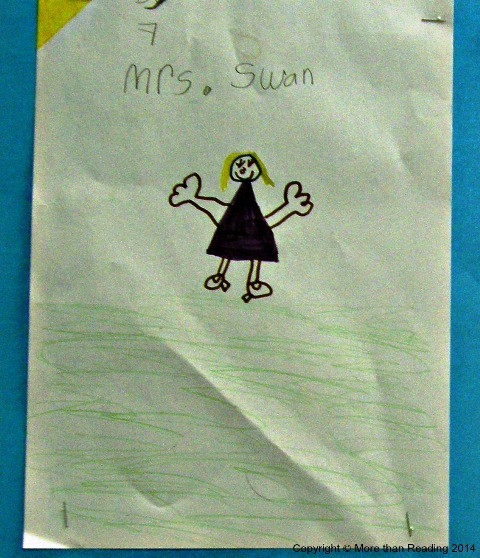 The children draw large, colourful self-portraits on their papers. 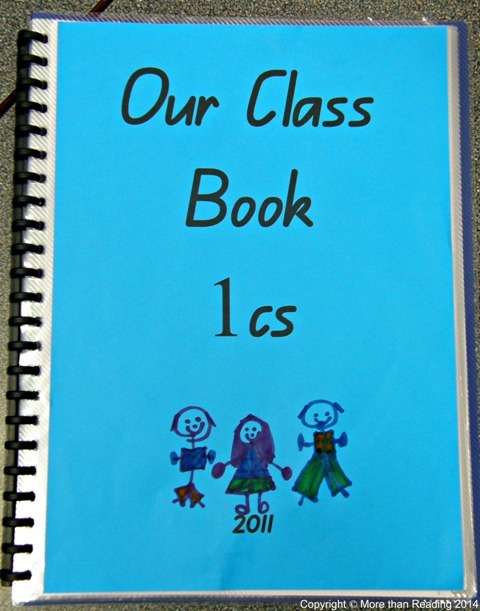 The completed pages go into an A4 display book to become a Class Book for shared, independent and home reading. 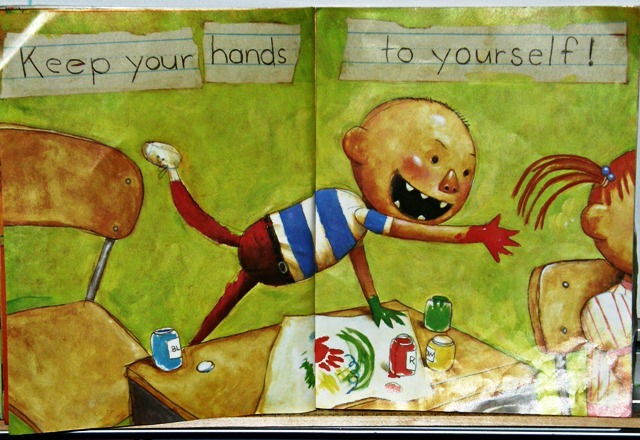 Children are excited to read a Class Book about themselves, on the first day! One teacher extended this strategy by putting the completed pages into youblisher for the children to read from the IWB. A great idea! an A4 display book for class reading. Before free play ‘activity time’, the class reads the ‘expected behaviours’ on the board, that were compiled in the morning. The children practise the behaviours as they ‘play/work’ at blocks, duplo, pattern blocks, magnetic letters, small whiteboards, home/drama, puppets, collage, drawing, writing and reading. Go slowwwww… to establish the routines for packing up. I help the children read the labels and put materials back in the ‘right’ places on the shelves. Establishing orderly routines for line ups and exits helps keep children safe . Walking quietly to the playground helps the children understand their responsibilities in not disturbing other classes en route. Children play on the playground equipment (15 minutes), have drinks, go to the toilets, wash hands and walk back to the classroom. To ensure the children write on the first day, I introduce ‘journal’ writing on A4 papers. 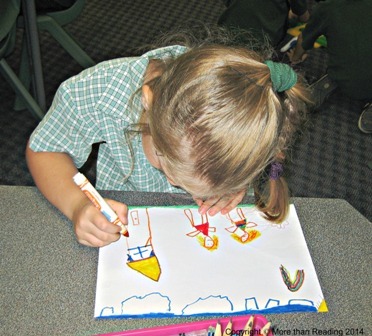 Children write their names and draw and write about an experience or item of interest. It’s a perfect time to observe which children tackle drawing and writing with confidence. On ‘sticky notes’, I record names of children who write their names and/or attempt writing words and sentences – and tuck the ‘sticky notes’ in my pocket for use later. (The Botany books that become Journals, aren’t unpacked yet. Children will start using them tomorrow). Some children volunteer to share their ‘driting’ with the class. Some children draw and I scribe their stories. Starting 10-15 minutes early helps establish the routine of children getting their food and going out for afternoon play. I’m at the line up area early to reassure children they are at the right spot. Children put hats in their bags, have drinks and move to the mat area. Mozart wafts from the CD player as children cool down and relax on the floor for 5-10 minutes. 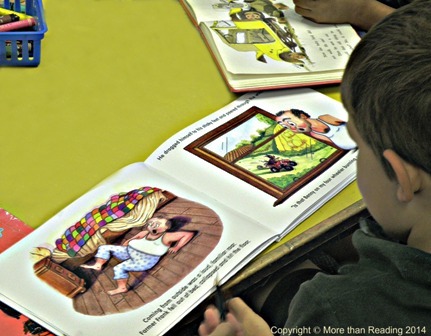 The children settle on the mat for read alouds of ‘easy read’ books. Beginning readers and those already reading, usually join in and read. Children’s comments about sentences, words and letters reveal their understanding about written language. Four ‘easy read’ books, with big print, rhythmical and/or repetitive language include: P. Horacek’s What is black and white? 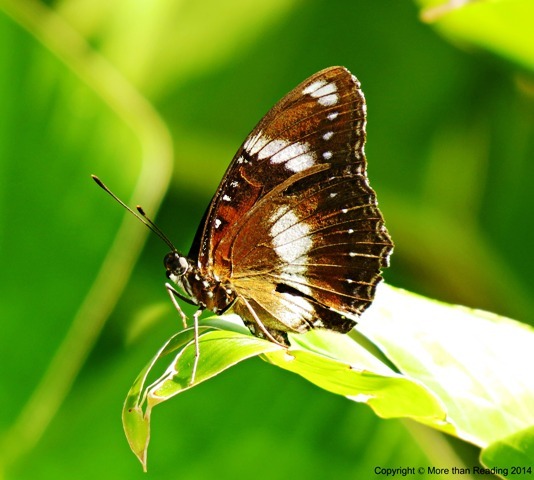 Strawberries are red, Flutter by, butterfly and Bruce Deegan’s Jamberry. 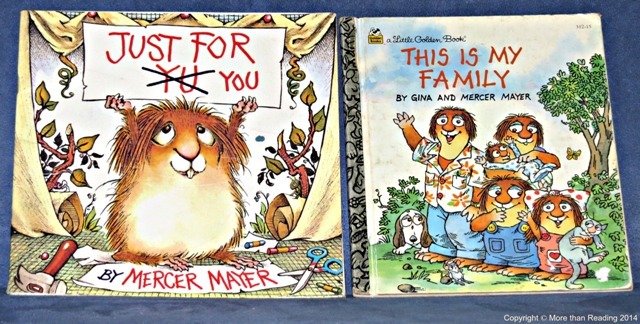 Then children hear the repetitive sentence pattern in Mercer Mayer’s Just for You. 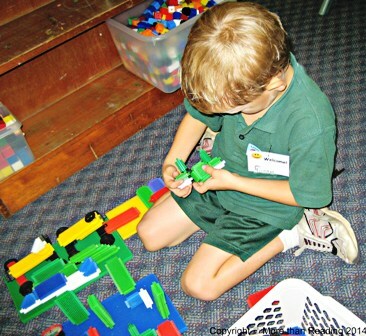 Children explore and play with pattern blocks, beads, geo boards, puzzles, buttons and plastic chain links. They count/sort plastic coloured bears, dinosaurs and insects. They sequence numbers on a small 100 board. And they build shapes with plastic coloured polyhedrons. Children sit on the mat with backpacks and check they have their hats, drink bottles and lunch boxes. We re-read the Class Book revising the children’s names. If there’s time, we finish up with a read aloud story and/or sing familiar songs, reading the words from charts. 2:50 Happy children meet their happy parents at the door after their first day, talking, reading and writing in Year One! Doing lots of reading, writing, drawing, talking on the first day allows me to begin to know the children: their interests, personalities, maturity, creativity, confidence and which children struggle with making sense of print. Have a wonderful first day! I’ll be thinking of you. And to Northern Hemisphere children and teachers, I hope your new semester is going well. 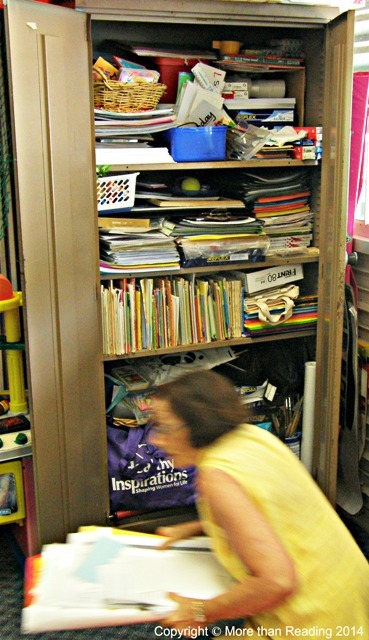 The old, brown, metal cupboard lurks at the back of my classroom. It is full – very full! Materials, made and collated over recent years, are stacked inside. The latch is stiff. On the second attempt to open the doors, I lean into the cupboard with my shoulder. The doors burst open. A mini avalanche of books, charts and cards cascades into my hands! 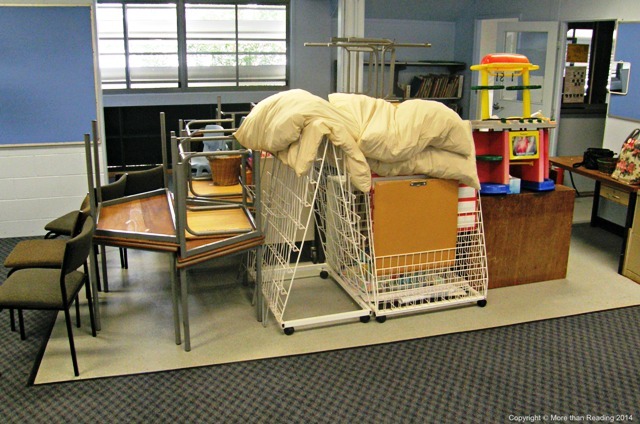 Yesterday focussed on the physical environment of the room – getting the class ‘areas’ organised and placing the furniture. Today is about sorting materials and constructing the calendar wall. Literacy and numeracy cards feature big print. 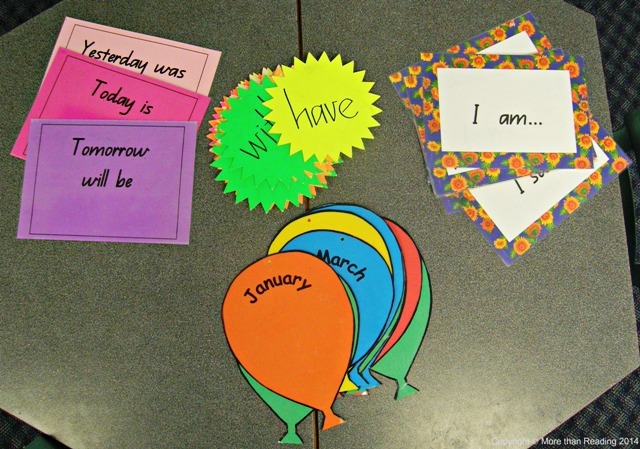 This enables children to read the cards from various parts of the room and is especially helpful for children seeking spelling support during writing times. The cards are A4 size, colourful and laminated to last. Some of the cards are bundled with elastics and bulldog clips and stored on shelves for easy access. 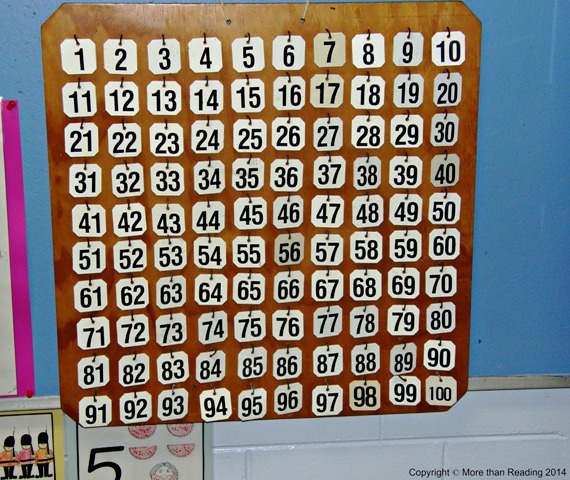 Number cards are taped beneath the calendar wall and colour cards are pegged on the wires near the mat area. Alphabet cards will go up one-at-a-time, according to class interests, children’s names, curriculum and handwriting sequences, etc. over the next few weeks of first term. 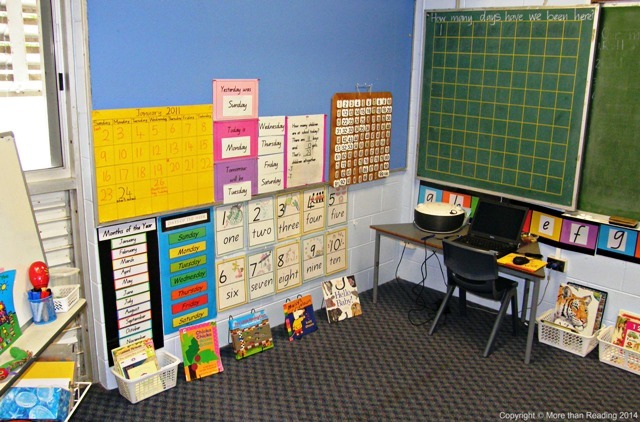 Literacy and numeracy charts feature big print enabling children to read the charts from the floor and tables in various parts of the room. The charts are A2 or A3 size, colourful and laminated. 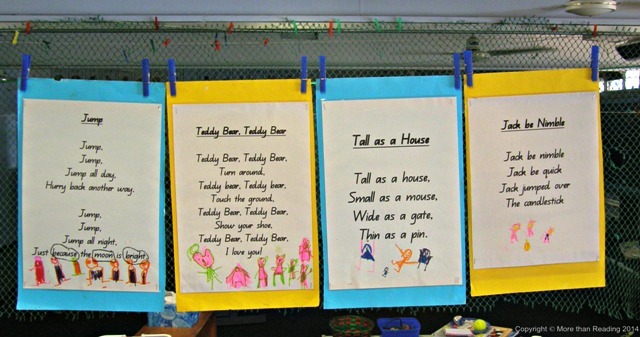 Four rhyme charts are pegged on a wire so they are easy to read from the mat area. Thus, a Prep or Year 1 child may sit ‘fairly still’ for 8 – 10 minutes, but then s/he needs to get up and move – really move; jump, hop, wriggle, stretch! Rhymes play a fun and purposeful role here as they give opportunities for children to move their bodies to the rhymes and at the same time, hear rollicking, rhythmical language. Reading is also involved; children see, say and hear the words simultaneously as I point to each word with a metre stick. and for children to reach and write on. The January month chart is ruled up and labelled on large ‘poster’ card. ‘Yesterday, today and tomorrow’ cards are pinned/stapled to the board. ‘Blu-tac’ is used on the back of the day cards so they can be moved easily. 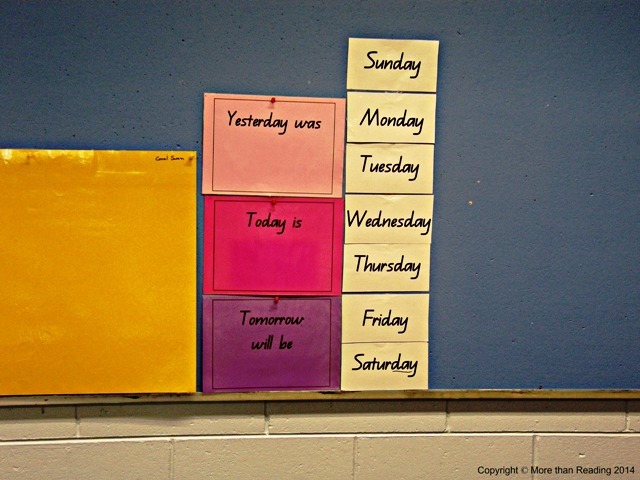 The attendance chart goes up next to the days of the week. (Counting, adding and subtracting in a meaningful context). The 100 number board goes up next. It’s heavy and needs to be secured with strong hooks and string. (Counting by ones, tens, fives and twos). Great! I don’t have to do anything here. 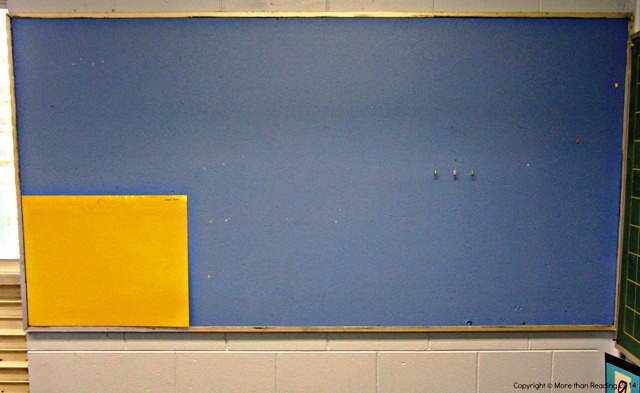 blackboard in the corner of the calendar area. Finally, months of the year chart, days of the week chart and number cards are stuck on the bottom half of the calendar wall, with blu-tac (see photo above). 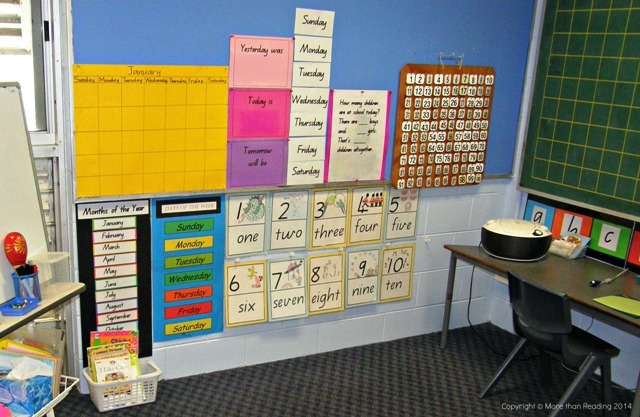 In the first two weeks of school, a large chart of the children’s names and a schedule of days and times of specialists’ classes (music, computers, library and physical education) will be added to the calendar wall. 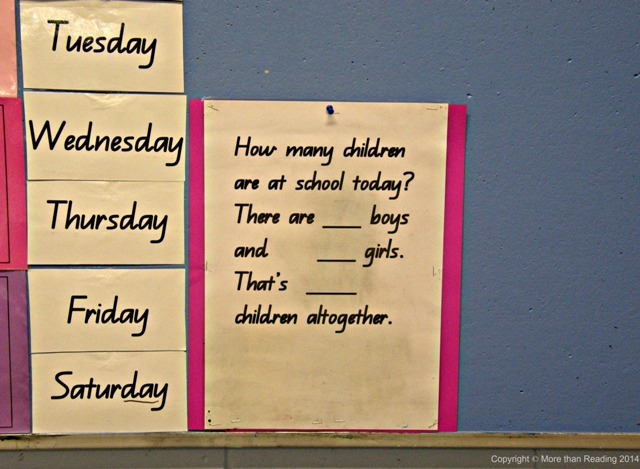 ¹ (Read more about the Calendar Wall in Teaching Strategies for Literacy in the Early Years ‘Dates with the Calendar’ Pg. 22). Cards and charts, constructed, collected and collated over the years (some by me, some by my teacher aides) are sorted. Some cards are displayed. Others, like alphabet cards and sight words, are more relevant and meaningful when the class is involved in placing them on walls and wires over the next few weeks, as we build literacy and numeracy displays together. 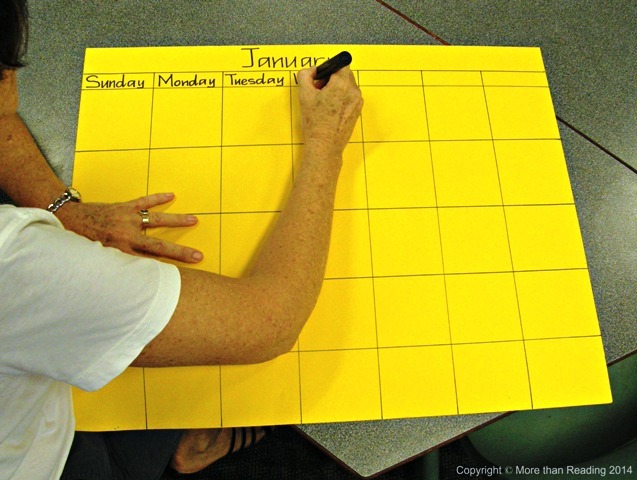 Almost completing the calendar wall is a relief – it’s a big job and it has to be ready for the first day with children. Two more days to complete finishing touches before children arrive. But for now…it’s time to go home! Although not full-time teaching any more, it’s still exciting for me to hear friends, parents and colleagues ‘talking teaching’ – to hear of their hopes, plans, ideas and concerns for beginning another school year. 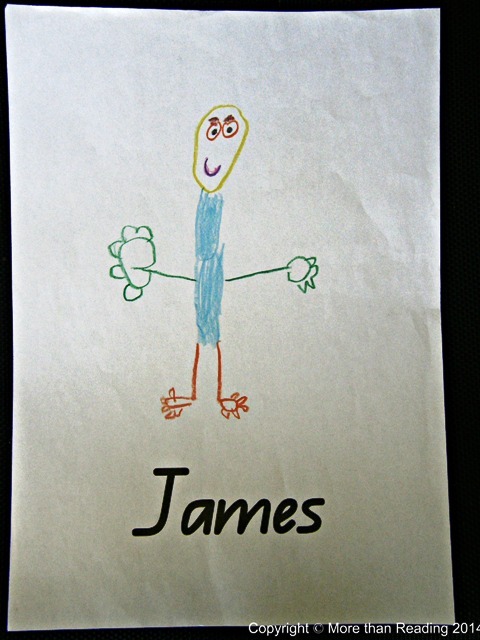 In response to requests and encouragement from Early Years teachers, I will re-publish over the next 14 days, my Seven Part ‘Starting School Series’ of blogs for ‘old’ and new teachers of Prep, Year 1 and Year 2, in particular for Early Years teachers in Australia, who are busy preparing for their new school year. I have revised and enhanced the series; clarifying, simplifying and reorganising each of the seven parts. A scanned photo from my Doctoral Thesis of the physical layout of a previous classroom, has been inserted in Part 1 of the series. Since a picture is worth a thousand words, all the photos have been edited and enlarged for easier viewing. “Snow pellets on my jacket are like raindrops on the roof,” I said to my husband. I had come inside after shovelling overnight snow off the driveway. But, the snow falling this morning was different from any snow I’d seen before. The snow I knew was like big, soft flakes. This snow was like hard, tiny pellets. “Snow pellets aren’t like raindrops,” he remarked with a grin. “Okay. The sound of snow pellets on my jacket are like raindrops falling on the roof,” I replied. “What if it’s a wool jacket?” he asked. It has a pink ribbon. “The details. I’ll do it and show you,” she said and went off to write in her Journal. But my favourite example of ‘adding detail’ was from Suzy. One day, completely out of the blue, she wrote in her Journal: “I brought my adventurous, big, brown bear and he got into lots of trouble…”. Sometimes it takes a while for new ideas to become a part of children’s thinking. And it’s a wonderful surprise when it all comes together. But back to the snow pellets… “I think that crusty, pellet-type snow is called corn snow. It’s a term I haven’t heard for years,” he reminisced. From its prison behind your eyes. O’Neill’s words would make a great poster to inspire budding writers in the classroom!